TeamSupport is leveraging IBM’s Watson technology to provide internal sentiment analysis on Ticket Actions. You may notice public Actions scored with sentiments like satisfied, polite, and frustrated, along with scoring on the Ticket. The goal for the Watson data is to help you better understand your relationships with your Customers so that you can continue to provide them with exceptional service. Additionally, you can use the service to understand how your team’s written communications may be perceived by your Customers. This analysis can highlight training opportunities for your agents in order to improve the tone of your communications and elevate conversations with your Customers. Ticket Sentiment is available as a weight in our CDI calculation. The two values working together will enhance your understanding of your customer health and satisfaction. Going forward, we are planning to add Ticket Automation rules which will let you run triggers on Action sentiments. *Please note that this data is not visible to your Customers and is only displayed internally. The tone detector is ‘tuned’ specifically for support interaction, and will detect language that fits the listed emotions from the context of a Support Agent/Customer conversation. Tone is expressed by your word choices, punctuation, and the level of formality in your writing. Here are some example sentences for each sentiment. Yes, that time works fine for me. I appreciate the help with this. I’m glad we were able to fit you in so quickly! I’m glad that solution works for you. Please let me know your next availability. May I suggest using our reference guide? I’d like check on a few things first. Could you please provide me with your ID#? I am very disappointed with those options. I really wish that hadn’t happened. We feel like our concerns are not being heard. This has been a very frustrating experience. I don’t like the options presented. Your whole company is useless. 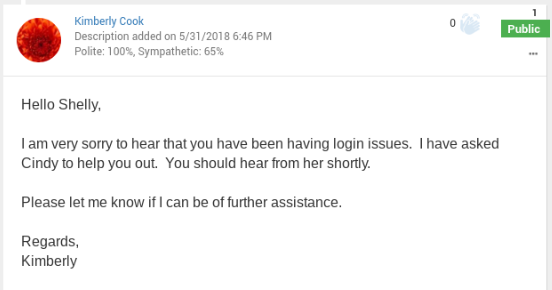 I’m sorry you’ve been having trouble logging in. The text of each public Action on a visible Ticket is analyzed for sentiments. Actions created by Users and Contacts are analyzed. The result may be that no sentiment was detected, or there may be one or more sentiments detected. If detected, the sentiment(s) will be listed at the top of the Action along with a percentage score which illustrates the confidence that the Action has the indicated sentiment. For example, text that is analyzed with the results of “Frustrated 66% Sad 74%” indicates with a 66% confidence that the author of the text was expressing frustration, and 74% confidence that the text expresses sadness. You may not see this information instantaneously as it may take a few minutes to populate. Scores 50% and above are only listed to ensure that the system is providing a confident score. When evaluating scores on Actions, it’s important to realize that 50 is the lowest calculable score. With this perspective, a score of 57%, for example, can be considered a “low” score. Therefore the number is scaled as follows: (5 * -9.5) + 500 = 453 (rounded up). The result of 453 indicates that they system is more confident that the Ticket has negative sentiment (< 500) than positive. Did the Customer start out frustrated at the beginning of the Ticket, but their tone improved by the end of the Ticket? How did the agent’s tone affect the tone of the Customer? Did the Customer’s tone turn from positive to negative? Could the Ticket have been escalated before it turned sour? Are there any patterns in the tones of successful agents? 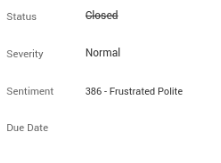 Ticket Sentiment Analysis can be disabled at any time in the Admin panel.